Monarch butterflies are incredible creatures. They're the only insects known to migrate 2,500 miles each way. 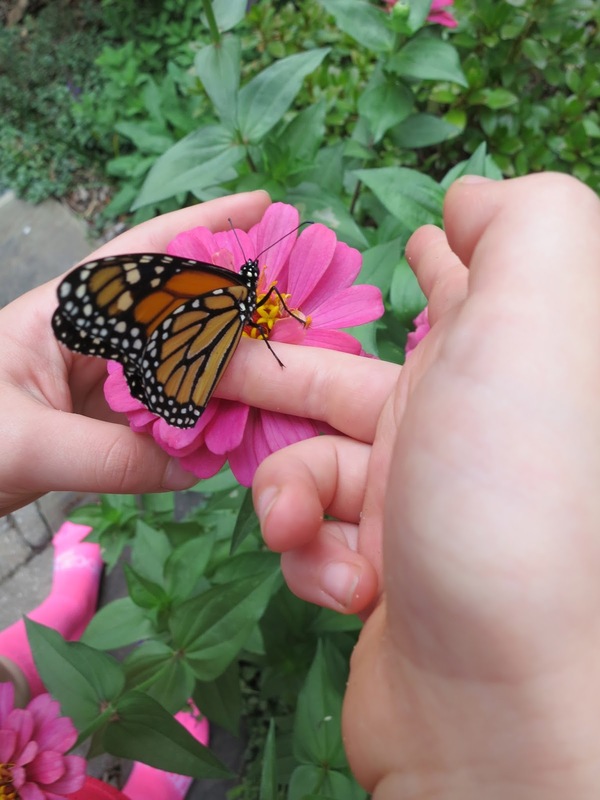 Because they can't survive freezing temperatures, monarchs make the long journey from Canada to Mexico, or from northwest of the Rocky Mountains to Pacific Grove, CA each year. A new generation, born in the warmer destination, returns to the very same trees in their northern habitat in spring. How they find their way is a mystery scientists have only begun to uncover. The butterflies' compass may be related to the earth's magnetic pull and the position of the sun. As noted in recent posts, monarchs were once endangered due to depletion of milkweed. Milkweed is the only plant where female monarchs leave their eggs, and the only food source for monarch larva. Conservation efforts restored the population to some degree, but continued habitat destruction and climate change are resulting in lower numbers once again. 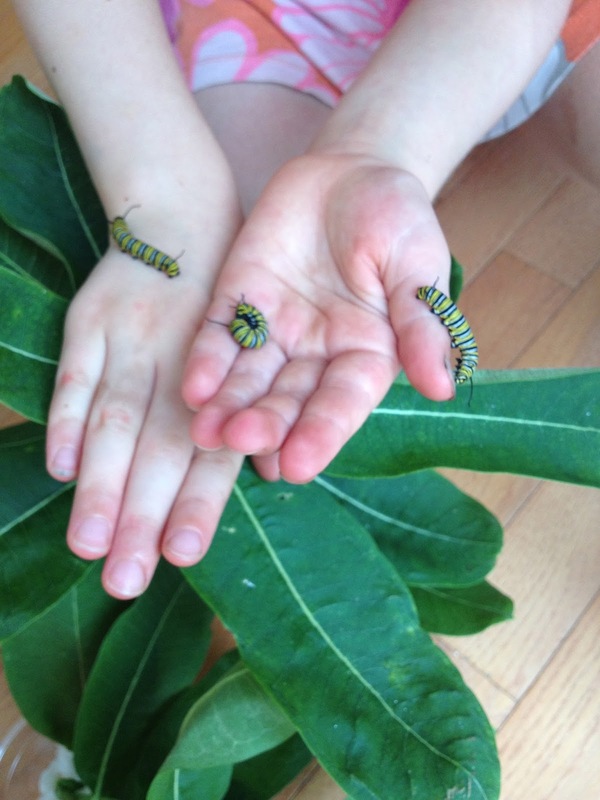 Due to the generosity and dedication of Mona Miller, a local naturalist who works tirelessly to support native plant habitats and the butterflies that rely on them, we obtained Monarch larvae and raised them in our home. 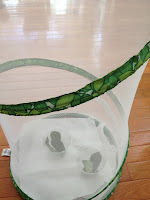 Here is a pictorial story of three stages of their life cycle, from larva to adult butterfly (we did not have the good fortune to witness their first stage, the egg). 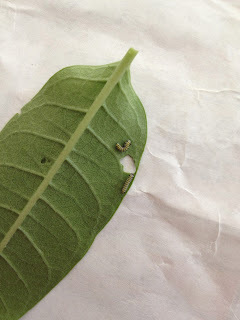 Day 1: Eleven 1st instar larvae, each about 1/2 centimeter long, begin their journey in our habitat. 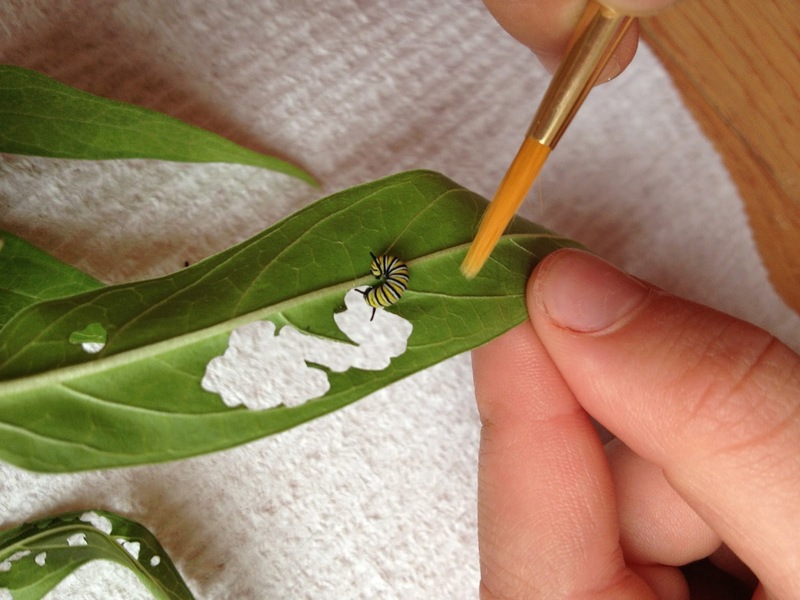 Monarchs shed their skin and grow about 5 times during their larval stage. Each shedding and growth period is called an instar. Day 4: the larvae are already about 1/2 inch long. 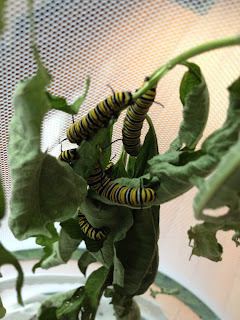 Day 6: We need to transfer the larvae to new milkweed on a daily basis. We use a paintbrush to move them. Those are 6-year old fingers, so you can see that the larvae are still tiny, but growing! Day 8: They're large enough to handle. Day 10: We're quickly running out of milkweed, a common problem for people raising monarchs. Luckily, my friends at Green Spring Garden gave us a little more until we made it to the next stage. Day 12: The first chrysalis! It's an ethereal, translucent green, with a gold seam. Inside, the larva is undergoing an amazing metamorphosis. 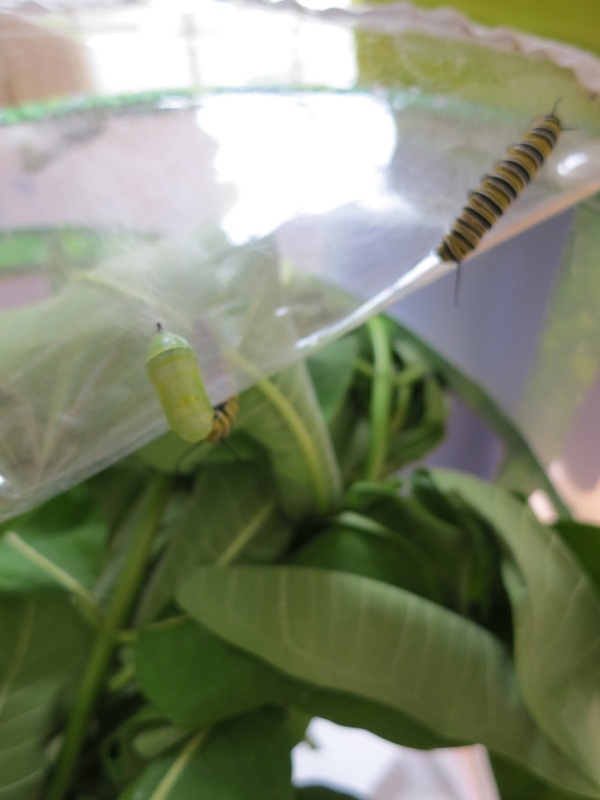 Day 26: The monarchs remain in their chrysalis for about 10-12 days. Here are several newly emerged adult butterflies, with a few chrysalids still hanging on. We released the Monarchs in our garden. Of the original 11, 10 survived. They didn't hang around long. We watched them spiral up to the trees, rest on leaves for a few minutes, and then take off to the great blue yonder. We are so grateful to have witnessed their miraculous transformation and wish them well on their journey.